A group of beef cattle farmers is demanding to know why levies worth millions of dollars have not been used to improve slaughterhouses in Indonesia. The Australian Beef Association has taken aim at Meat and Livestock Australia and LiveCorp over the $3 million producers pay the two organisations. The association, which represents about 1000 beef producers, say a $5-a-head levy on sold stock should have been used to fund animal welfare programs and training in Indonesia. The federal government yesterday moved to ban live exports of Australian cattle to a number of Indonesian abattoirs following community and political outrage over the mistreatment of animals. Association chairman Brad Bellinger says there has not been proper use of the millions raised from the levies. “We’re quite angry about it,” he told ABC Radio today. But MLA says the money is being well spent, rejecting the comments of its long-time critic. “We’ve got a crisis I think to deal with; we’ve got to stay the course,” managing director David Palmer said. 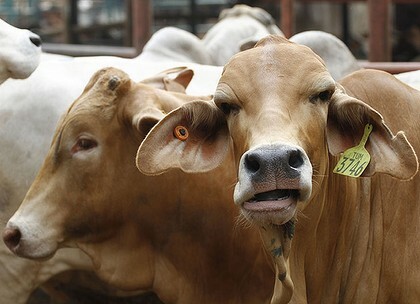 The live cattle trade to Indonesia would continue “with or without Australia”. Nationals leader Warren Truss has backed the government’s export ban on sub-standard Indonesian abattoirs, saying it was an entirely appropriate response. “You cannot allow Australian animals to go to that sort of death,” he told ABC Television of graphic footage showing mistreatment of cattle before slaughter. But it would be a mistake to ban all live exports to Indonesia and penalise those abattoirs “doing the right thing”. Nationals MP Darren Chester says there are some social, cultural and economic issues that needed to be dealt with. “It’s a complex issue and let’s not pretend the minister is going to have an easy solution,” he told reporters in Canberra, adding he supported the export ban on sub-standard abattoirs. A north Queensland mayor has questioned whether Australia had any responsibility to police slaughter practices in Indonesia. Charters Towers mayor Ben Callcott said Australia could not govern what other countries did with anything. “As long as we keep things correct on our shore, that’s all that bothers us really; that’s all that our jurisdiction covers,” he told ABC Radio. The Charters Towers district is a significant supplier to the live cattle export trade. The suspension of live cattle exports would hurt 70 per cent of cattle producers in northern Australia, Mr Callcott said. McKinlay Shire mayor Paul Woodhouse warned there would be consequences of any knee-jerk reaction ban on live exports. He queried whether other exporting nations, such as Brazil or Chile, would involve themselves in animal welfare issues in Indonesia. South Australia’s Agriculture Minister Michael O’Brien said yesterday that live cattle exports to some Indonesian abattoirs should be suspended until animal welfare could be guaranteed. He said he supported Agriculture Minister Joe Ludwig’s decision to suspend the practice to some abattoirs following footage collected by Animals Australia that showed cattle being mistreated before slaughter. “The cruelty revealed on Four Corners shows that efforts to reform animal welfare standards in Indonesia have not been entirely successful,” he said. Mr O’Brien said the decision could create opportunities for the South Australian beef industry. “There could well be a shift towards chilled beef exports instead,” he said. This entry was posted on Wednesday, June 1st, 2011 at 7:43 pm and is filed under ANIMALS & STOCK, Cattle. You can follow any responses to this entry through the RSS 2.0 feed. You can leave a response, or trackback from your own site. Created by miloIIIIVII | Log in | 81 queries. 18.446 seconds. | Entries RSS | Comments RSS.